William Theodore Coombs was born in Ilchester in 1891, the son of Prudential Assurance Agent George Coombs (1851-1910) originally from Dorchester, Dorset, and Frances Mary née Drewer (1855-1947) originally of Preston Plucknett. George and Frances were to have seven children. In the 1901 census George and Frances were listed living in High Street, Ilchester, with their children; James Levi (b1884, Yeovil), Dorothy M (b1889), 9-year old William and May Elizabeth (b1894). In 1910 George died and Frances was living at 38 Cromwell Road, Yeovil, with her children James, William, May and Nellie Beatrice (b1885) and her grandson Lancelot George (b1907). William, by now aged 19, was working as a clerk in Aplin & Barrett's factory in Newton Road. It is not known when William enlisted, but he spent much of his service in the Pay Corps, a natural branch of the army for a former clerk. However, he was transferred to the 1st Battalion, Devonshire Regiment. His new Service Number was 40858. Around the end of June 1918 William was sent to France to join his battalion. He held the rank of Corporal. In mid-April 1918 the 1st Battalion, Devonshire Regiment held a salient near Nieppe, successfully defending their positions against repeated German counter-attacks. They remained around Nieppe until late July. The Forest of Nieppe had become notorious for German gas. It became a nightly programme of the enemy to drench the wood, which was low-lying and infested with pools and undergrowth, with their noxious ‘Yellow Cross‘ shells whose poisonous fumes bore the flavour of mustard. In August the German army began to fall back and the 1st Devons took part in the rapid Allied advances that characterised the rest of the war. Between 21st and 31st August they attacked and captured German positions, repulsing some fierce counter-attacks. But those ten days cost the Devons 263 casualties. William Coombs was killed in action on 30 August. He was 27 years old. In its edition of 20 September 1918 the Western Gazette reported "Mrs Coombs of 26 Everton Road, has received the sad intelligence that her son, Corpl. W Coombs of the Devon Regiment, was killed in action in Flanders on August 31st (sic). The deceased was formerly employed as a clerk at Messrs Aplin & Barrett, and previous to being transferred to the Infantry served in the Army Pay Corps. He had been in France about two months. The following letter has been received by Mrs Coombs from the Commander of his Company - Dear Mrs. Coombs, I am very sorry to have to inform you of the death in action of your son, No 40858 Corporal Coombs. He was killed on August 30th while taking part in an attack. Your son had not been with us very long, but had managed to win the respect of all officers and men of his Company." 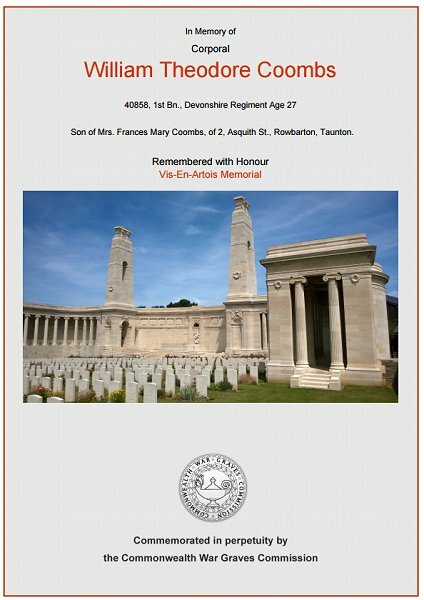 William Coombs is commemorated on Panel 4, Vis-En-Artois Memorial, Pas de Calais, France. His name is recorded on the War Memorial in the Borough. The Commonwealth War Graves Commission certificate in memory of William Coombs.